If you want to improve the performance and sound without generating major labor intensive modifications to your vehicle, then usually an exhaust system is one of the first steps. This is the Magnaflow Competition Stainless Steel Cat-Back Exhaust System that has been designed with smooth mandrel ends that reduce exhaust turbulence under acceleration. That and the 3" piping size will create improvements in throttle response, reduced turbo lag, with gains in both horsepower and torque. 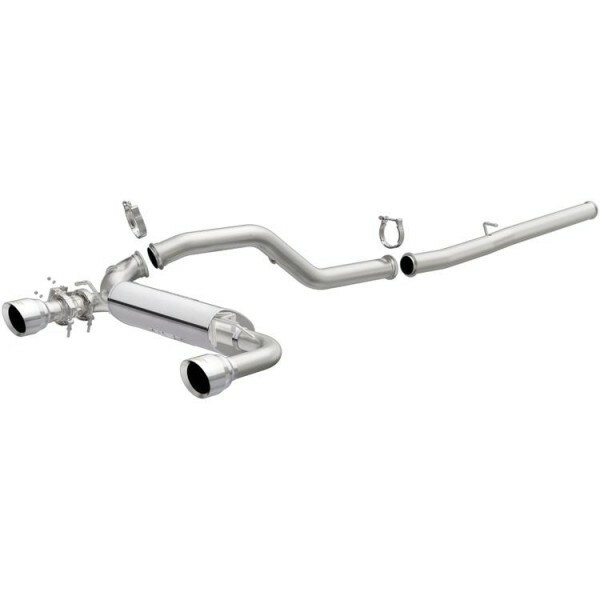 This exhaust system has been fabricated from 409 stainless steel, and the exhaust design exits through a premium muffler with a pair of 4" polished tips. This exhaust system will come provided with v-band clamps, and exhaust hangers are welded onto the OEM locations so you don't have to perform further modifications to the body of the vehicle when installing. Once installed, users can expect a more aggressive exhaust tone under idle, and under full throttle.